Since the mid-1990s the number of private landlords buying properties to let in the rental market has risen significantly. Rental properties have become an attractive asset class for investors as more people are living in rented accommodation since buying a home has become increasingly difficult for many households due to housing shortages, growing prices and deposit levels. Furthermore, preferences amongst younger generations have changed, many now prefer to remain flexible and not be tied down with large mortgages. The UK is most certainly moving away from the vision that everyone should be a homeowner. With one in five mortgages going to fund the Buy-to-Let market, the popularity of the sector has drawn the attention of regulatory bodies, who are concerned with maintaining the chances of first-time buyers and rental property living standards. This has led to the recent clamp-down by the government on Buy-to-Let investments, where they have taken away many of the tax benefits of investing in them while increasing regulation. These changes have significantly disadvantaged individual investors. Consequently, the market is starting to transition towards a more professionally managed sector. Although this is expected to drive up standards and provide a much better experience for the growing number of renters in the UK, it creates a strong disincentive for individual investors to participate. Nevertheless, as an asset class, Buy-to-Let is still a very attractive investment proposition. 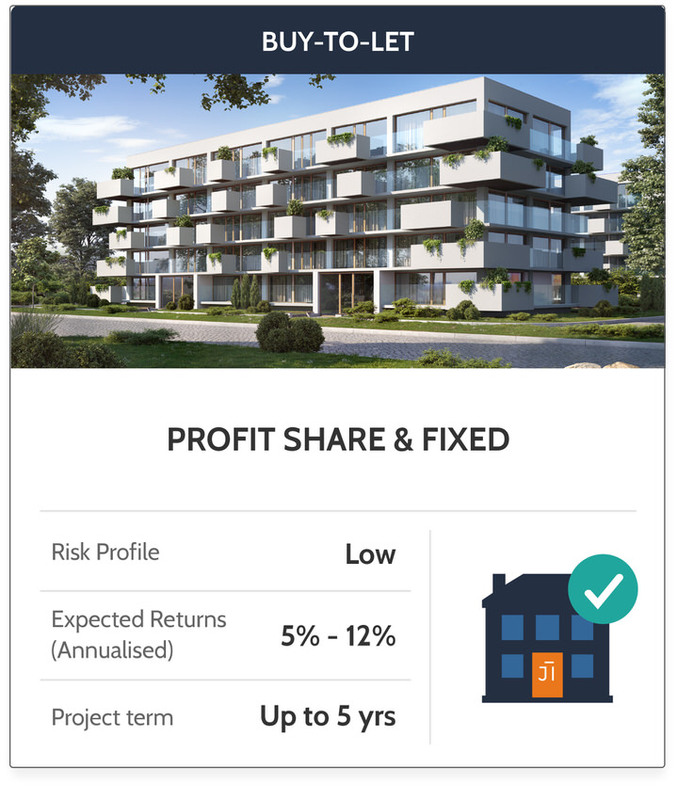 A way around having to deal with all the hassles, tax and regulatory complications is to invest into properly vetted and professionally managed investment properties through Shojin’s Property Crowdfunding platform. We take care of the entire process on your behalf. Firstly, we source suitable properties which meet our strict criteria and we conduct due diligence on them to make sure the risks are mitigated. Once we are happy to proceed, we launch the investment properties onto our platform for funding and find the tenants. During the tenancy, we carry out the day to day management, collect the rent and maintain the property. This leaves the investor with simply collecting the profits, which are distributed on a regular basis throughout the investment period. The attractiveness of Buy-to-Let is typically measured by two indicators – the rent and value. The price appreciation of the property (capital gains) is an important factor in calculating the profitability. Today, in some markets such as London, relatively modest rents are more than compensated for by rising property values. Most investments are held for around 5 years, during which time investors expect the market to grow so that they can make their profit through the increase in capital value. This is where you invest in a share of a property investment. You will receive income (after all expenses) and a share of any profits when the property is sold. Typically, this can deliver a 2%-4% annual income and 3%-6% annual capital growth providing a blended return of 5% to 10% per year over a 5-year period. This is a great product for those who want to invest in rental property and are happy to receive some income as well as share any capital gains from the change in value of the properties. This is for those investors who want exposure to increasing values and are not looking to receive regular income. Typically, this can deliver 9% to 12% per annum over 5 years. You may receive any residual income that is not paid out to the “Income only” investors. This product is most suited to higher rate taxpayers who prefer not to receive income on which they pay income tax but to benefit from capital growth and make use of their capital gains tax allowance instead. This is where you can choose to forego any future capital growth in return for a fixed monthly or quarterly income. Typically, this will provide you with a fixed 5%-7% interest rate per annum. This suits lower rate taxpayers who require regular income and prefer fairly low-risk investments. It is backed by a second charge on the property (taking the bank debt and mezzanine to a maximum of 75% of the value of the property). The risk on this product is lower than the other two because the interest payment is prioritised. In the event that interest cannot be paid for any period then the interest is “capitalised” so that the unpaid amount itself earns interest until it is paid out. Please note that the above does not constitute tax advice and investors should seek their own tax advice to ensure the product is suitable for them.